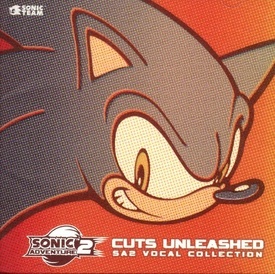 Cuts Unleashed SA2 Vocal Collection is a compilation of the seven theme songs in Sonic Adventure 2, plus one action stage theme, "Escape from the City." Taking a cue from the album releases of Sonic Adventure, this mini-album was commercially available a month before the rest of the game's soundtrack, Multi-dimensional. The release itself came with a booklet containing linear notes from the composers, as well as a sticker featuring the images of Sonic and Shadow. Though labeled as the Vocal Collection, a number of songs containing vocals within Sonic Adventure 2 were omitted from the album. This included the body of Knuckles' levels, which featured raps overlaying the music in those areas. As those songs were included in Multi-dimensional, they were most likely omitted simply to adhere to the precedent set up by the Sonic Adventure soundtrack offerings, with the mini-album focusing on the character themes. This page was last edited on 8 October 2018, at 21:57.